In the early 2000s, taking inspiration from David Phillips, the guy who got more than a million airline miles by buying Healthy Choice pudding, I participated in a shopping promotion run by American Airlines. I had to make purchases through 25 different partners in order to receive 25,000 miles. In those days, that was hard to do because American just didn't have that many partners I could shop through, and many of the partners they had were specialty stores I wouldn't have otherwise visited, such as a fly fishing shop. More than 15 years later, it's a different story: Airlines have struck deals with so many retailers that you can purchase nearly everything you need through an airline shopping portal. Other programs, such as hotel loyalty programs, have shopping portals too. Here's how to make airline shopping portals work for you. 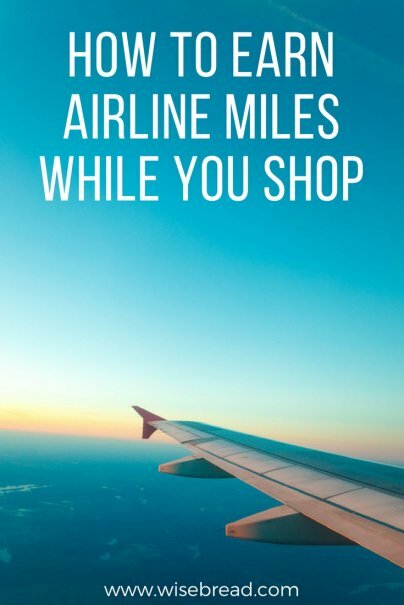 All the major airlines and programs have shopping portals, such as Southwest Rapid Rewards Shopping, United MileagePlus Shopping, AAdvantage eShopping Mall, Delta SkyMiles Shopping, and Hilton Honors Shop-to-Earn Mall. It may not be enough just to have a frequent flyer number with an airline. For instance, to get miles for shopping Delta's portal, you have to enter your frequent flyer number and other personal information first. Peruse the portal's offerings and figure out if you can use it to do any of the shopping you were going to do anyway. For instance, I needed to replace a headlight on my car. I could have driven to an automotive supply store, or ordered it on Amazon, but because I was trying to collect miles, I clicked through an airline portal and purchased the bulb through AutoZone instead. With general purpose stores such as Walgreens, Walmart, Kohl's, and Target, these portals now allow to do almost all your shopping this way if you want. One thing you need to keep in mind when using an online shopping portal is that the company offering the reward (in this case the airline) will be tracking your clicks when you move from the shopping portal to the retailer site. Because of this, most miles malls will warn in their fine print that the service won't work if your browser cookies are turned off or if you use ad-blocking software. More rules may pop up when you select a store or specific offer. For example, certain products or brands may be excluded from the offer, or you may not earn miles if you use a coupon code. The great thing about this step is that you're probably using a credit card that also pays you a mile or more for every dollar you spend. When shopping through a miles portal, you get both the credit card rewards and the shopping rewards. A true double whammy! Sometimes the miles you earned aren't credited to your account. Many of the portals have an email form just for reporting this. You should probably start by contacting the merchant, and then if they don't help you, contact the airline. To be honest, so far I haven't had miles deducted from my account after having to return something, but the terms of service of the miles mall I was shopping warned that it could happen. Just make sure you return any items you are planning to, before you use the miles. Either subscribe to email alerts or check the site regularly, because merchants offer special deals that might even make it worth it to try a product or service you wouldn't have otherwise bought. For example, I recently saw an offer for 1,500 AAdvantage miles for buying a $12 magazine subscription. Since 1,500 AAdvantage miles are worth about $22.50 at 1.5 cents a mile, and since it costs $29.50 to buy 1,000 miles directly from American, this deal would be a no-brainer if you just needed a few more miles to make an award — even if you never read the magazine. Southwest Airlines even has an extension you can install so that a button shows up on your browser when you're shopping to remind you to click through their portal. However, you'll have to check the fine print again, because some stores don't pay miles on gift card purchases. If you are racing to accrue just a few more United miles before booking a flight, stick to the United shopping portal. However, if you have a lot of loyalty programs and just want to maximize your earn, the site ev'reward will tell you who's offering the best deal at the moment. To use it, type in the name of the retailer you plan to shop, and ev'reward will give you a list of different portals and the reward rate each is currently offering. You can also browse by category, which is great if you know you want to order some coffee, for instance, and you're willing to buy it from any store offering the best reward.